Office & Home Rubbish Removal Barnet EN | Quality Property Care Ltd.
Commercial and residential junk removal is the most optimal solution for loft clearance, office clearance, house clearance, builders waste removal and waste disposal, garden waste removal and all clearance situations with big junk amount available. To find more information, call us, please on 020 3746 4287. You can contact our polite client support associates! We are also competent at removing organic and garden waste starting with grass trimmings and cuttings, soil and turf, hedge trimmings and hedges, garden weeds, plastic liners or bags, flowers and plants, litter, leaves, small branches, twigs, straw or animal bedding, Christmas decorations and trees, plant pots and a lot more. There are particular collection points where we will put these materials, however, there are particular charges that you might need to cover. We work inside the bedroom, living room, children’s room, kitchen, garden and hallway. We can safely and securely remove and dispose of wardrobes, beds, bedside tables, dressing tables, ,mattresses, chests or drawers,, armchairs and sofas, side and coffee tables, living room storage TV stands and cabinets, console tables, shelving units, cot beds, , bunk beds, playgrounds, bunk beds,wardrobes, desk and chairs. In the kitchen we remove dining tables, stools and benches, dining chairs, barbecues, umbrellas, shoe cabinets, racks and stands, hoods and hangers, wall shelves, baskets, portmanteaus. There are household items like fridges, freezers, fridges and so forth that require special disposal and have extra fees attached to them. While on the phone be sure to mention that type of couches we are taking out as this will help us determine how many men and what equipment to bring. We prefer that you bag the items before we come, however, it is not necessary as our team can do that as well. Starting with single mattresses, tables, washing machines, ovens,, double mattress, divan beds, dryers,cupboards, TVs, PC monitors Kitchen units, armchairs, single beds, fridges, TV stands,, mirrors, 2 seated sofa, double bed, freezer, book shelves, microwave, carpets, 3 seat sofas, king sized bed, wardrobes and tubs. These are just to name a few. Pieces like microwaves, TVs and tires are charged extra as they demand a special disposal method to guarantee their safe removal and recycling. 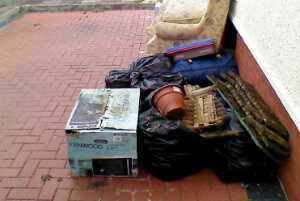 Once you book your onsite viewing, one or more rubbish collection specialists will arrive at the spot which has to be cleared, or where the rubbish will be collected. Based on the kind, size and condition of the waste which needs to be collected, the experts make an estimate. The customer is not required to agree with the offer. In case the price complies with him or her, the rubbish collection and rubbish clearance starts. The technicians from Quality Property Care Ltd. collect the waste and transport it, gardening waste or any other type of rubbish to the most suitable and nearest recycling hub or dumpster. 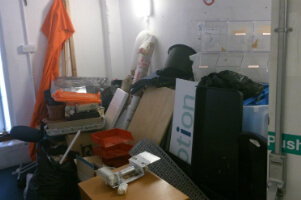 So, maybe it is time to clean out your office, garage, home, or loft and make some space for really useful stuff. Book your rubbish removal and rubbish clearance service right now! To book this service contact 020 3746 4287 and define your needs, how much we are removing and what type of materials we have to clear out. Make certain that they are quickly accessible as this will make our job a lot easier and lower the hassle we have to go through. Use the booking form to get more answers or to book direct, without any holds off. The customer support center is accessible so feel free to call anytime you need us, all free of charge and without any obligations to our company. We can talk to you and come for a survey free of charge, if you call ahead of time.